SH wave ultrasound has been demonstrated to successfully undertake a range of NDT tasks, from thickness measurement of flat plates without calibration, to defect detection in simple and complicated structures, as well as welds. The EMATs used to emit and receive the ultrasound are able to produce multiple SH modes, with a fixed wavelength leading to good mode selectivity, which allows the appropriate mode to be selected. The periodic structure of the EMATs also means that the ultrasound can be steered just by changing the pulse frequency. Below is an example of a D-scan performed to laterally position (and eventually size) defects in a through thickness weld of a plate. The defects can clearly be identified. This figure depicts a D-scan across a weld, with the emitter and receiver adjacent to each other. 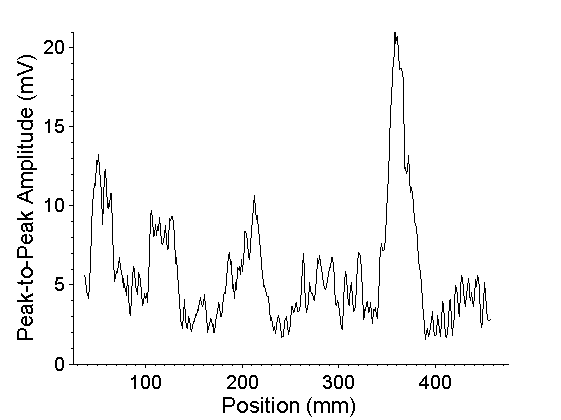 The additional reflected signals (above the noise level of approximately 4mV) from defects in the weld lead to an increase in the peak-to-peak amplitude, clearly identifying where the defects are laterally. PPM EMATs have been used to emit and receive SH waves in conducting samples. SH waves can propagate through complicated geometry sections of the samples. SH waves have been used to successfully measure plate thickness and to detect defects in plates and welds.